Residence Small house in wilds of Winterhold. Hakkar was born of nord parents. Inheriting the height, strong physicality, pale skin colour and sharp facial features of the nords. His rough and scarred face display the way of life in his clan. Living as an ancient nords, in wilderness where each day is battle against Skyrim's cold climate. 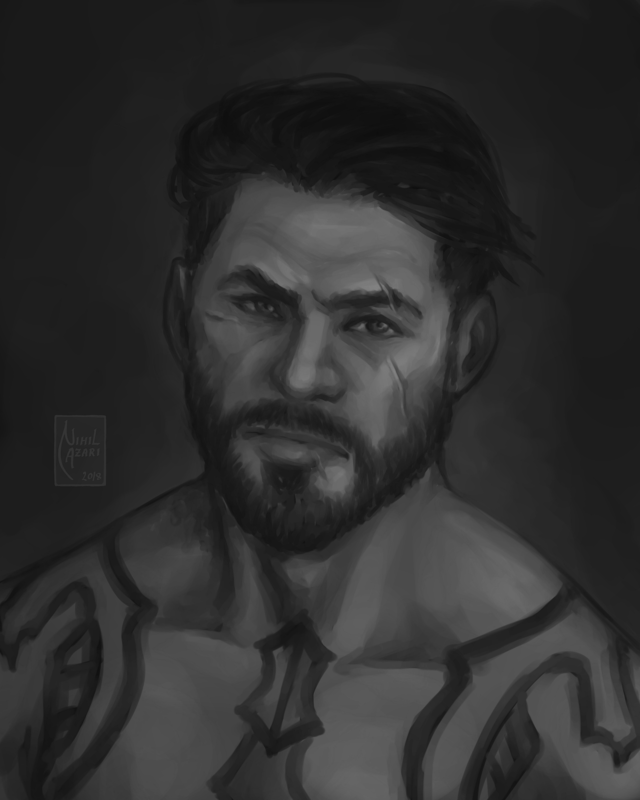 Despite his rough lifestyle, Hakkar tends to his appearance with care, donning nicely cut hair and full beard. Hakkar has changed fairly after he became vampire. His skin has become even paler than before, once green eyes that burnt with life has turned into blood-red, filled with hunger. Even his ears has reshaped into more pointy ones. Usually friendly and outgoing towards strangers, humorous, the man loves to enjoy his life, be it spending peaceful evening with friends, striding through wilds, conquering new heights, delving into the lowest depth or just going on suicidal adventures. Hakkar is fiercely loyal individual, a true warrior at heart. His hard life has taught him the value of friendship, as such he holds high regard for it and will lay down his life for friend without a second thought. Yet as much as he values friendship, he holds equal hatred for betrayal and two-faced snakes. Vampirism alters one not only from surface but from within too. Hakkar was no different, his adventurous spirit was torn out from him, thus once cheerful and outgoing man has turned into quiet, brooding and grim person. He always had deep connection with nature, wildlife and once that connection was severed, void in its' place was filled with anger and sorrow. Yet even curse of Molag Bal wasn't enough to shake his most cherished trait, Loyalty. For him betrayal was nethermost a man could fall. Origins of Vulonkiir bloodline is unknown. Was it direct gift of Molag-Bal or strain formed from Lamea's bloodline, is still mystery. It is presumed that Blood-Father of Vulonkiir was an ancient nord as bloodline's name is derived from dragon tongue which translates into Children of Night. Vulonkiir vampires are mortally weak to sunlight and has visible vampiric features, thus they live very solitary life and rarely seen within or close to big settlements. Vulonkiir are said to be physically powerful and brutal breed, using their unbridled strength to brutalize foes and seeding fear in hearts of those who come to know them. One more of their notable and possibly the most trait that is most frowned up not only by mortals but their own kin too. An almost insatiable crave for blood, which often leaves their prey completely dry of blood. Almost all of their preys that are drained of blood has bite-marks, which has given birth to rumour that Vulonkiir vampires do not posses natural ability to use blood magic, usually found in form of Vampiric drain, common gift of majority of vampire bloodlines. Your text to link here... (Link to google drive doc that describes Vulonkiir Bloodline pros and cons better, which is my own fan made bloodline). Black Scales' Syndicate was founded by Hakkar Thunder-Hawk. A team of businessmen that are focused to widespread their influence and trade within borders of Pact and beyond by creating companies, supplying merchants, financing projects and more. Some people even whisper ill words that Black Scales aren't only in legal business but sometimes into illegal too such as smuggling, underground pit fights and black market. Whether this is true or not up for you to find out. Legend has it that Clan Thunder-Hawk was founded by one of the original Five Hundreds Companions. After Ysgramor and his men conquered Skyrim and build cities, some people preferred to live in wilds. One of those people was Aelakja Thunder-Hawk, who took her people in mountains of Winterhold and settled there. 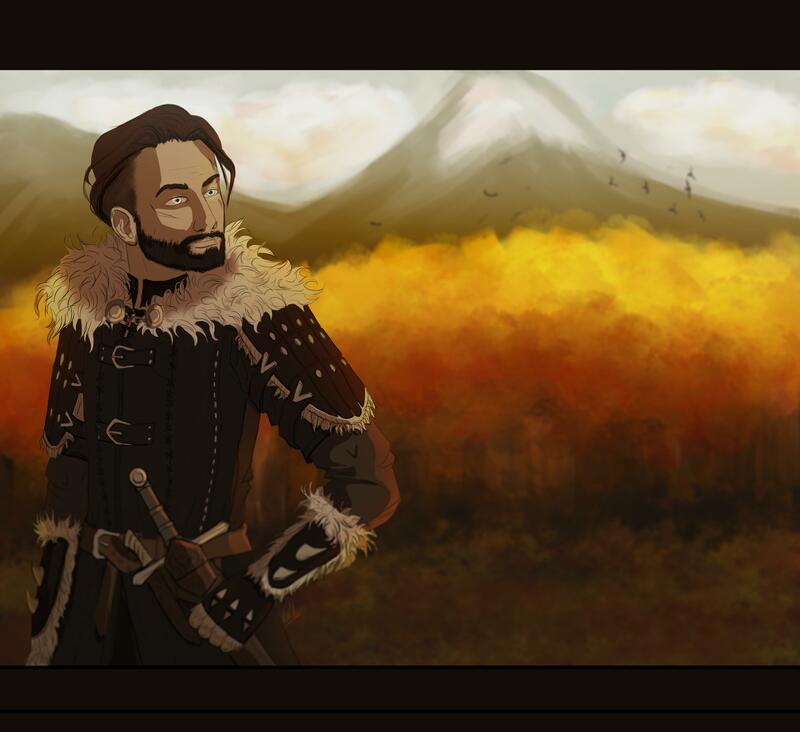 Centuries has passed but clan has lived up to their founder's wish and lived in wilds like an ancient nords. Relaxing on tree in Wrothgar. Encounter with Jimmy(Ogre) during Wrothgar Trip. Sharing drink on battlements of Wayrest with Audemar.